"...It's a wonder these women do not kill each other, but unite in their mutual plight and common religion to support each other to succeed. And in the end, you may be left wondering if it is an American dream or an American nightmare to be setting this course for citizenship in today's divided atmosphere where fear of discovery forbids you to really live your life at all." "...Director Jon Lawrence Rivera manages to make the lives of these six women interesting - and sometimes even gripping. The ensemble cast works well together to help the show come alive. At the same time, there is a static quality to six people trapped together in a small space. As one audience member quipped, "It's kind of repetitive...the same things happens over and over." Maybe that's the point in today's world. One issue which may have deserved greater exposure: Does going through the expense, fear, loneliness, and pain required to deliver a baby in the U.S. mean that the expectant mothers are from a second-rate place? A place not as good as the one where their offspring will be born? Otherwise, why risk so much for so little?" 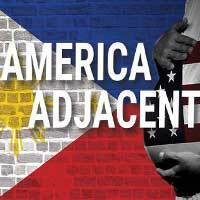 "...The United States proves far from paradise for six Filipino women seeking a brighter future for their unborn (or recently born) infants in Boni B. Alvarez's captivating and compelling hot-button-issue dramedy America Adjacent, a Skylight Theatre Company World Premiere." "...Just like everyone else. That is hallmark, not incidentally, of fine acting. Everyone seems real. We recognize them as people we know. Sometimes as ourselves." "...America Adjacent not only serves as an eye-opening look at how many people in the world view America - it is also an ode to strong women. These mothers-to-be came alone to a foreign country and put up with less-than-ideal conditions for the sake of their children's future. Humorous and compassionate, America Adjacent is not to be missed." "...Under the sensitive direction of Jon Lawrence Rivera, this ensemble is terrific, playing off each other with seamless, boundless energy, filling the stage with pathos and joy. I loved them. Handsomely mounted, the production boasts a scenic design by Christopher Scott Murrillo, lighting design by Matt Richter, sound design by Austin Quan, costume design by Mylette Nora, and properties by Lily Bartenstein. The production stage manager is Christopher Hoffman." "...Alvarez's play is, of necessity, not a taut drama with a clear storyline, involving, as it does, six disparate women with no other connection except arbitrarily crossing paths in a Los Angeles safe house. It is more of a slice of life that illuminates, without judgment, the predicament they, or their families, have chosen." "...Everything is. And yet everything isn't. And this play has the power to reveal that truth to us. Thank you, Skylight Theatre and Boni B. Alvarez." "...But while America Adjacent may be on track as a group portrait and cultural beacon, it misses the mark as a cogent drama. Some of the story threads are under-developed, even as the more prominent ones are too steeped in melodrama. The interaction among the characters often consists of petty squabbling (degenerating at one point into hair-pulling) and other scenes come across as too obviously aimed at our edification, while at the same time failing to propel the narrative forward (Paz refuses to eat a traditionally American birthday cake because it's unlike the ones she's accustomed to)."